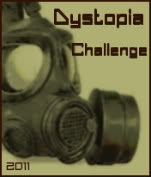 Dystopia is quickly becoming my new favorite genre, and I keep snapping up new books to read left and right. So, to help me make a huge dent in this pile, I have signed up for the 2011 dystopia challenge. Interested in joining? The official rules and sign-up page can be found here. I will be starting with the "Soldier" level - that's 30 books - and going from there.